VIENTIANE (8 Nov 2018) – A 3-0 win over Laos in their opening match would have made any coach smile from ear to ear. But then again, Vietnam head coach Park Hang-seo is not just any coach. Vietnam – champions in 2008 – are chasing only their second AFF Suzuki Cup crown and tonight they made sure of a grand start in front of more than 15,000 fans with two goals in the first and then another after the break. “Tactically, we could have provided more alternative instead of just at the centre of the park,” said Hang-seo. With high expectation from the team under Hang-seo, it came as no surprise that the big population of Vietnamese having settled here in Laos came to support the squad. So much so, the stadium was a sea of red as they cheered from start to finish and created a festive atmosphere throughout. 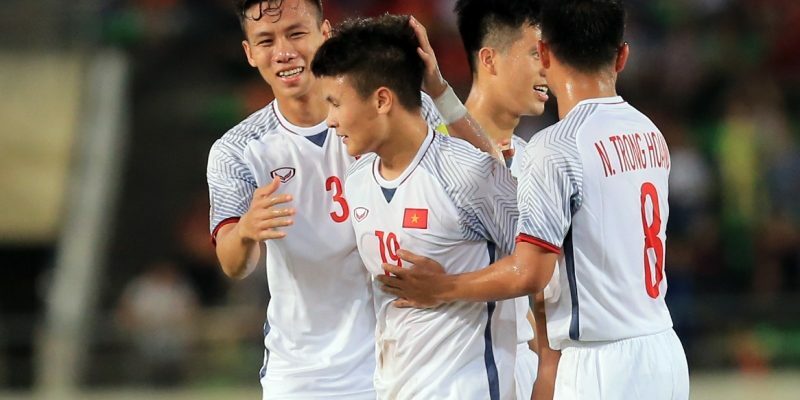 Vietnam were in total control and with Nguyen Cong Phuong pulling the string from midfield, it took the just 11 minutes to grab the lead and who else, but Cong Phuong to rush in and slot the ball home. Laos goalkeeper Saymanolinh Praseuth having a string of timely saves, it took Vietnam right at the end of extra time to slot the second goal with Nguyen Anh Duc pouncing on a rebound. Laos tried to came out from their half after the break but Vietnam were just too solid at the back as the best that the home team could muster was a curling shot from Phouthone Innalay that forced an excellent save from custodian Dang Van Lam. Vietnam then wrapped things up their third goal of the match off Nguyen Quang Hai’s low freekick. “Vietnam is a strong team but we made some individual mistakes and that led to us being under pressure,” said Laos head coach V. Sundramoorthy.